As purveyor of iconic American iron, Harley-Davidson (H-D) has seen mixed fortunes of late, facing declining sales and an ageing rider demographic. Last year, the Milwaukee, US, company announced both a new engine, the Milwaukee 8, and an ambitious plan to release 150 new motorcycle models between 2017 and 2022. Considering that H-D was basically flogging an engine design from the 20’s in a chassis looking like it came from the 50’s, with riding dynamics from the 80’s, we were somewhat skeptical about its claims that the new machines were improved, and handled better than before. Before the H-D fanboys come piling on the author, do note that he has spent considerable time on a 1997 FLSTF and thus knows exactly what he’s writing about. 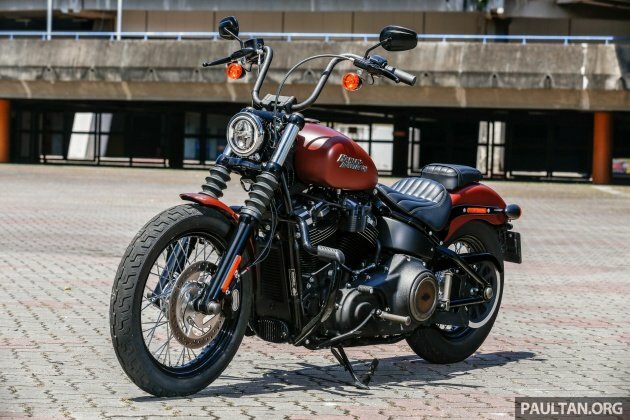 Coming back to what’s new and improved on the 2018 range of H-D bikes, we did have a sample a while back, with the Iron 883. 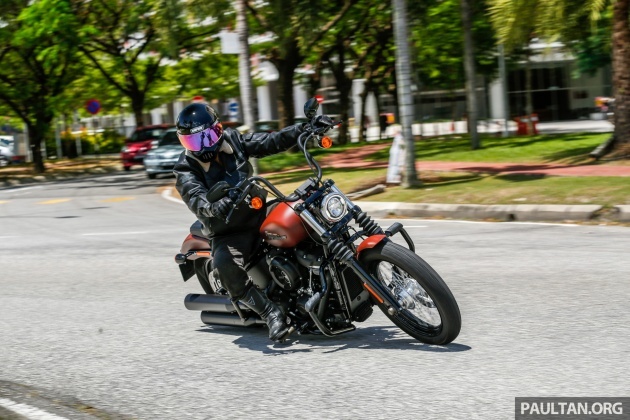 However, with the advent of the Milwaukee 8 V-twin, H-D is touting that its cruisers, bobbers and tourers are now firmly up-to-date, and designed to appeal to a younger crowd, as well as bringing things closer to developing markets with the establishment of an assembly plant in Thailand. 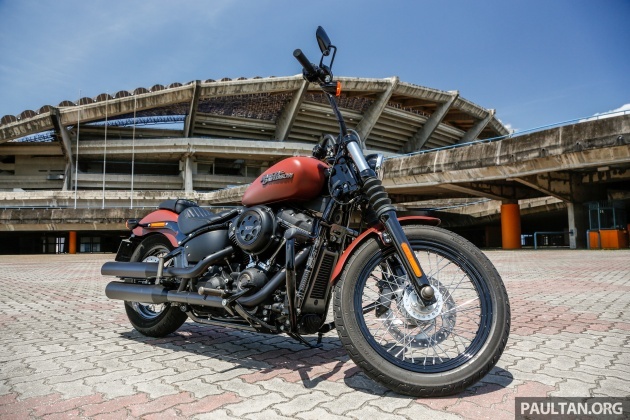 For Malaysia, the H-D name has seen something of an upheaval of late, with the switching of its official distributorship in 2018, dissolving a business partnership it had with the previous distributor across 22 years. Thus, with a new distributor, we are expecting things at H-D Malaysia to be different, and better, going forward. 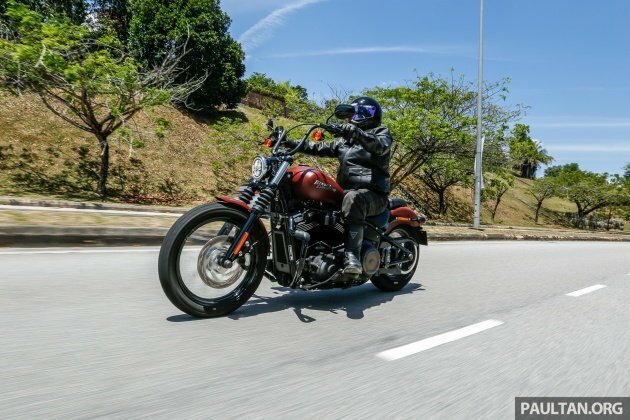 In keeping with that, H-D Malaysia is currently awaiting the arrival of its showroom stock but did have a couple of the 2018 bikes on the floor, namely the CVO Breakout and Street Bob, and asked paultan.org to take them out for a spin. Unfortunately the CVO Breakout was not available, but we did take the 2018 Harley-Davidson Street Bob out. It cannot be denied that H-D, in its products, relies a lot on heritage and tradition in its design ethos, and this is reflected in the way its bikes look, even after 60 years of technology marching on. It did have a golden opportunity to bring things into the modern era with the VRSC V-Rod and Buell line of sports bikes, but, unfortunately, the purists had too much of a say, and what we are left with is the air-cooled V-twin with separate gearbox. Since we did not have a lot of time with the Street Bob, this will be a quick first look at the highlights of the street cruiser, and the highlights, along with a couple of things which the potential buyer should be aware of. The design language of the Street is very minimalist, with no stray hoses or cables inside the engine area of the Milwaukee 8. In this iteration, the Milwaukee 8 V-twin in the Street Bob is a 107, which in H-D parlance means it displaces 1,745 cc, with the pots fed by sequential port EFI. H-D claims the mill is good for 145 Nm of torque at 3,000 rpm, with no official horsepower figure given. The gearbox, driven by chain in the primary case, has six speeds, with final drive by belt, as is customary for H-D. All this comes with a low slung seat that places the rider 680 mm off the ground, with 125 mm of ground clearance, in a package that weighs 297 kg, wet and ready to roll. Starting up the V-twin revealed a pleasant rumble in the bars, with more of a sensation than an actual vibration in the seat. Sitting on the Street Bob with the engine running put us in mind of a massage chair, more than anything. Reaching out to the standard fitment medium-rise handlebars, with the forward-mounted foot controls, we found the Street Bob fit our 168 cm frame properly, though the highway foot pads mounted on the crash guards were out of reach. Lever reach was just fine, and will suit most riders with average hand spans. Setting off on the Street, first gear was engaged with a bit of clunk, and we found a small issue with the gear change. Not a deal breaker, the lever was mounted just a touch high for our touring boot, and needed adjustment. However, with time short, we elected to live with the problem, lifting our boot off the foot peg to change gear instead of the usual swivel foot motion. Two minutes with a spanner will fix this, no problem, just remember to get the H-D technicians to fit the bike to you when you take delivery. Riding the Street Bob around on city streets and on the highway showed that handling the machine was a breeze. While steering effort was on the heavy side, the weight is well balanced, and during cruising, the Street Bob behaved well. Called upon for rapid changes of direction, the Street Bob, like its brethren, needed a lot of body English in executing the move. You need a very firm hand with this one, and cannot be hesitant in what you want to bike to do. Control is key here, and the tentative rider will soon get themselves into trouble if they let the bike get ahead of them. Control inputs need to be direct, and the rider must have a clear of idea of what they want the bike to do. Conversely, at lower speed, the Street Bob is very forgiving, and we have it on good knowledge that H-D is the only manufacturer which tests its range for “parade duty”, where bikes are ridden at walking pace for long periods. In this instance, at slow traffic speeds, the Street Bob showed no inclination for its 19-inch front wheel to feel vague or flop over. In terms of engine heat rising from the rear cylinder, we were wearing kevlar lined riding jeans, a gift from a good friend and riding buddy and did not feel anything. Sorry, we lost the label of the jeans, but suffice it to say, both our photographer and another colleague did remark that they did not feel comfortable with the BTUs being emitted, and we recommend you ride the Street Bob with proper gear on. During our riding around, we found the Street Bob behaved best at about 130 km/h cruising speed. The bike was capable of more, much, much more, but the lack of any sort of wind protection meant we had to cut short our high speed test due to the strain on our arms. Inside the cockpit, the instruments are extremely minimalist, with a single LCD readout displaying speed and gear position, with the other information accessed by pressing a toggle button on the left handlebar. The mirrors on the Street Bob, set at rider eye height because of the medium-rise bars, gave a good view of things behind, and were vibration-free. In fact, there was nothing we could term as unwanted vibration from the Milwaukee 8, with all engine movement damped to the point of being pleasant. There was no vibration to speak off in the foot pegs, and the bars buzzed only when the engine was revved hard. On the handling side of things, the Softtail frame was adequately sprung, and the forks provided a reasonable amount of road feedback, without that “disconnected” feeling that some versions of the frame displayed. At the back, the absorber was adequately sprung, and only balked when we deliberately rode over some bumps and small potholes hard. Tracking through corners was good, and as mentioned earlier, the rider should be firm and deliberate in handlebar movement. When leaned over though, we rapidly ran out of ground clearance, despite H-D saying the Street Bob has a 28-5 degree lean angle built-in on both sides. During hard cornering while shooting photographs, we ground down the foot pegs on both sides, and our colleague remarked the exhaust on the right side was millimetres away from scraping tarmac. 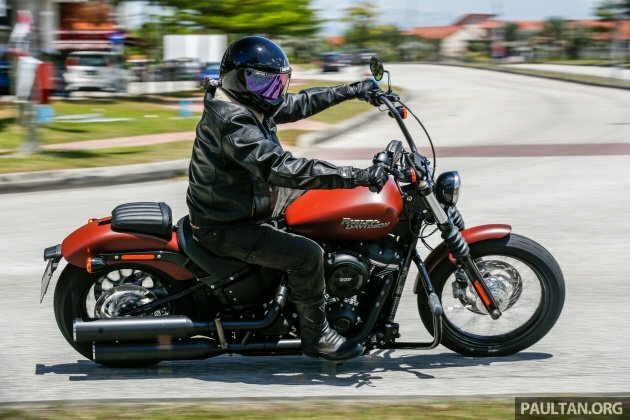 What the Street Bob needs is a the classic cornering line, with an outside-to-apex line, and hard-charging sports riders should think about other options. As for other modern conveniences, our review unit was fitted with ABS, driving a single four-piston calliper in front and a floating two-piston calliper in the back mounted on the 16-inch wheel. Fuel for the Street Bob is carried in a 13.2-litre tank. Starting is keyless, and the fob is carried in the rider’s pocket, with the security system coming on automatically when the rider walks away. Our review unit also came with a pillion pad that could be removed without using tools. H-D Malaysia has not given us any word on official pricing as yet, but all shall be revealed during its official opening next month at The Gasket Alley in Petaling Jaya. 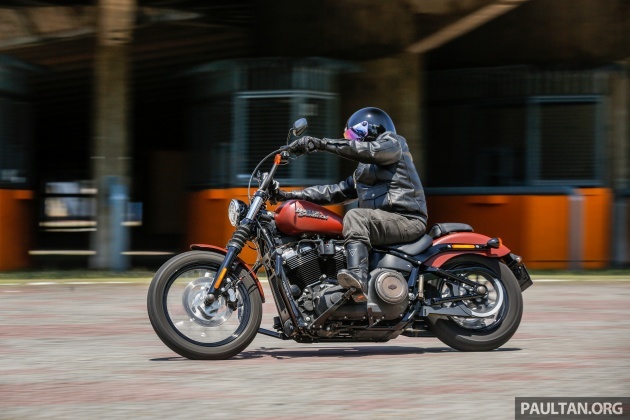 In the meantime, our take on the 2018 Harley-Davidson Street Bob is that new Milwaukee 8 V-twin is, indeed, a good ‘un, and the rest of the package, while not the latest and the greatest, does complement what the bike’s intention is, a laid-back highway cruiser. Hopefully pricing is cheaper now. Cause last time USD was 4.4 to the ringgit. Now it is 3.85 to the Ringgit. This means, HD Malaysia should be selling their bikes about 20% cheaper. Hopefully when HD Malaysia launches this, it will be about 20% cheaper than the usual pricing. In your dreams- dealer is going use that gap to make 20% extra profit. 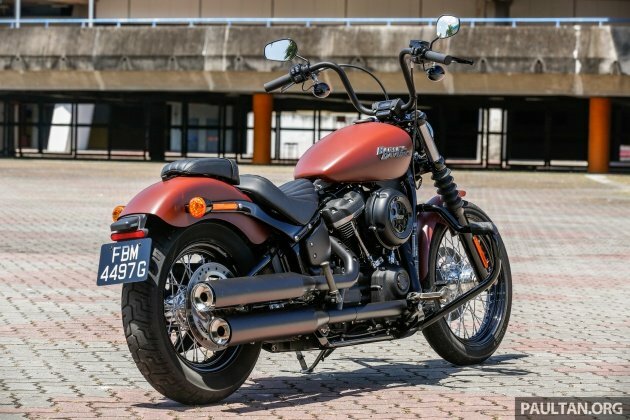 They’re not bound by any rules, hence why over here, an Iron 883 costs 90k and a Bolt 950 costs 60k, even though both are priced usd9k. Don’t blame the G, it’s the dealership. With H-D switching franchisee, how does the servicing go about? Still with Naza for existing customers? Existing Harley-Davidson customers are able to service their motorcycles at the new service centre, which has begun operations. Thanks veri much sir. And what about warranty for existing H-D customers from Naza bikes? Everything still valid? China should buy it and change its name to Ha Li. HD bikes design are all the same since history… What interest me to look here is the Simpson Bandit… Nice one Sir!!!!! Streeeeet Glide next please sir!! !